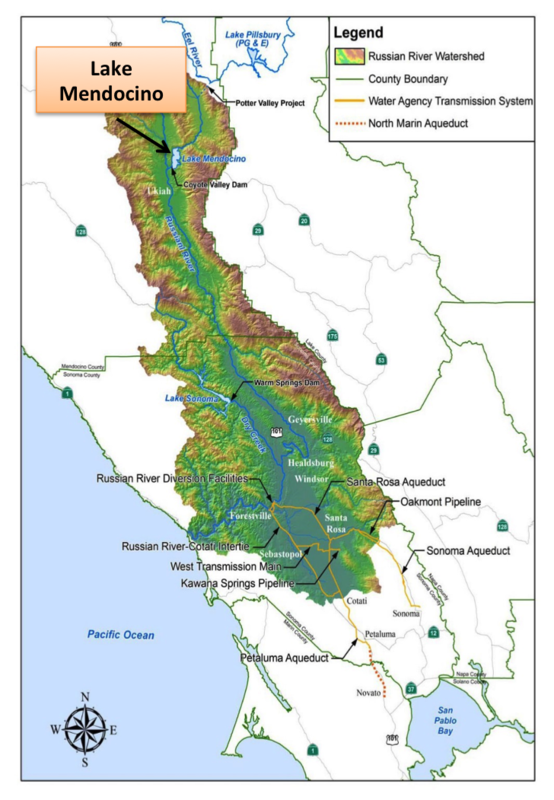 Map of Russian River watershed, including Sonoma Water transmission system. Source: Sonoma Water. Lake Mendocino is located on the East Fork of the Russian River in Mendocino County, California. Created in 1958 by the Coyote Valley Dam (CVD), it provides flood control, water supply, recreation and stream flow regulation. The U.S. Army Corps of Engineers (USACE) owns and operates the dam in accordance with the Lake Mendocino Water Control Manual (1959, revised in 1986). Sonoma Water (Water Agency) is the local partner that manages water stored in Lake Mendocino for water supply. The Lake Mendocino Water Control Manual (Manual) specifies elevations for an upper volume of reservoir storage that must be kept available for capturing storm runoff and reducing flood risk and a lower volume of storage that may be used for water supply. During a flood event, runoff is captured by the reservoir and released soon after to create storage space for another potential storm. The Manual is based on typical historical weather patterns – wet during the winter, dry otherwise. 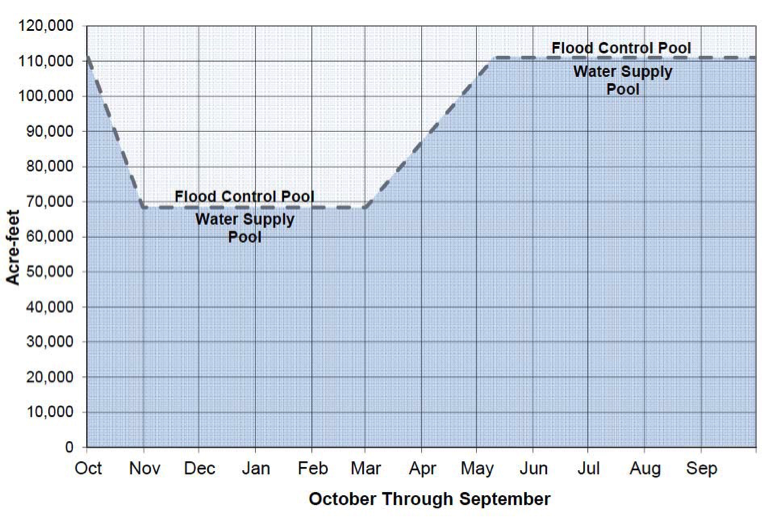 The Manual utilizes gross estimates of flood potential to establish reservoir storage and release requirements. It does not account for changing conditions in the watershed — for example, increased variation in dry and wet weather patterns and reductions to imported flows into the Lake that have occurred since 1986. Also, the Manual’s reservoir operations procedures were developed decades ago, without the benefit of current science that more accurately predicts weather and streamflow. Given reduced supplies, changed hydrologic conditions, and technological advances, some adjustments to the current reservoir operating procedures may be possible to optimize the goals of maintaining flood control while bolstering water supply reliability for downstream users and the environment (e.g., to support recovery of endangered and threatened salmonids). Modern observation and prediction technology could be used to reduce flood risk by supporting decisions of greater reservoir level drawdown in advance of storms. Or, such technology might be used to improve supply reliability by permitting more storm runoff to be retained for water supply while still preserving flood risk reduction objectives. Graph of Lake Mendocino Rule Curve. Water must be released from lake between November 1 and March 1, when water levels are above 68,000 acre feet. For example, following an atmospheric river-type storm in December 2012, water was released to create flood space according to the Manual, dropping reservoir levels by more than 35%. 2013 was the driest year on record, resulting in little inflow to refill the reservoir. By December 2013 lake levels were extremely low and remained low through 2014. Ideally, water from the December 2012 event could have been retained based on a longer-term precipitation forecasts, lessening the impact of drought. An interagency Steering Committee was formed to explore methods for better balancing flood control and water supply needs. The committee, consisting of state and federal agencies, the Center for Western Water and Weather Extremes (CW3E) and Sonoma Water are working together on a preliminary viability assessment to determine if Forecast Informed Reservoir Operations (FIRO) at Lake Mendocino can improve water supply, maintain flood risk reduction, and achieve additional ecosystem benefits. Recent studies show the potential for improved predictability of atmospheric rivers, which provide 50% of the region’s precipitation and cause most of the Russian River’s floods. Also, recently developed modeling capabilities and detailed field studies have provided a greater understanding of the hydrologic processes and watershed conditions defining soil storage capacity and the relationship between runoff and recharge in the watershed that affects the reservoir inflow from rain invents. Improve Supply Reliability for Downstream Uses – When storms cause moderate-to-high reservoir levels, normal operation is to release water to re-establish flood control space. With FIRO, some of that water could be retained for future supply as long as no major precipitation is predicted for several days and it can be demonstrated that the retained water can be released past downstream flood prone areas before the arrival of the next storm. This strategy will permit earlier supply capture in some years, improving summer season supply reliability for downstream water users and improving the timing and volume of releases to protect water quality and provide flows needed for recovery of salmonid populations. Enhance Flood Risk Reduction – When a storm is predicted to cause flooding, normal operations call for release of reservoir water and drawdown of water levels. With FIRO, release decisions would consider weather observations and predictions and the current watershed conditions, which, in some cases, would indicate greater drawdown for flood risk reduction so long as there is confidence that the amount of precipitation and runoff will restore reservoir levels for water supply after the storm. The full Lake Mendocino FIRO assessment will include identification, assessment and enhancement of the best science available to improve operations to maximize flood control, water supply and ecosystem benefits. The evaluation will identify realistic, short-term steps to provide more accurate and timely information about weather and watershed conditions. In addition to benefiting Lake Mendocino, the project has transferability potential throughout the western U.S. Lake Mendocino is not the only reservoir facing challenges. Water managers nationwide are grappling with the triple challenges of water supply, flood protection and ecosystem health in the face of climate change. In the long-term, infrastructure solutions may be required. But in the short-term, changes in reservoir operations could result in better water management. Identifying and navigating the steps necessary to change reservoir operations can be intimidating. One goal of Lake Mendocino FIRO participants is to document and share a process that can be replicated in other communities.